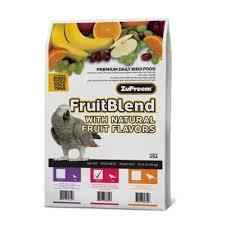 ZuPreem Fruit Blend is a nutritious diet designed to meet all the established nutrient requirements of various types of pet birds. 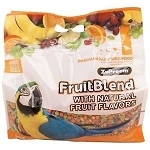 Formulated by a veterinarian and Ph.D nutritionist, ZuPreem Fruit Blend combines the highest quality ingredients with strict standards of quality control to ensure your bird receives the highest quality nutrition. Because it is an extruded diet, the diet is more thoroughly cooked than a traditional pelleted diet. The higher degree of processing means it is easier for your pet bird to digest, which means your bird will utilize a greater amount of the nutrients contained in each particle of the diet.. 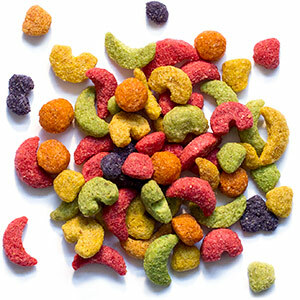 Ingredients: Ground corn, Soybean meal, Ground wheat, Vegetable oil, Wheat germ meal, Sucrose, Dicalcium phosphate, Calcium carbonate, Ground fruit (bananas, oranges, apples and grapes), Iodized salt, DL-Methionine, Choline chloride, L-Lysine, L-ascorbyl-2-polyphosphate, Natural mixed tocopherols, Rosemary extract, Citric acid, Naturaland artificial colors, Artificial flavors, Canthaxanthin, Manganous oxide, Zinc oxide, Copper sulfate, Calcium iodate, Sodium selenite, Vitamin A supplement, Vitamin D3 supplement, Vitamin E supplement, Vitamin K supplement, Niacin, Calcium pantothenate, Pyridoxine hydrochloride, Thiamine, Riboflavin, Folic acid, Biotin, Vitamin B12 supplement.